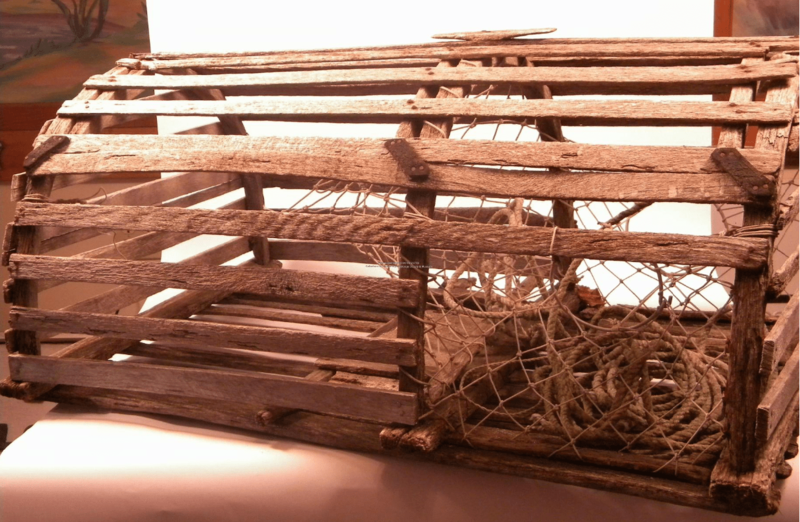 Old style wooden lobster trap. Most Pine Point lobstermen built and repaired their traps. Traps were made from oak. Bumpers were 3”x 2” oak-planked corners, the round-shaped traps had two bumpers on the bottom and three 1”x 1” oak bows placed in them with oak laths nailed to the bows. Galvanized or copper nails were used. Square traps had 1” x 1”-square pieces on all four corners. All traps were 32 or 36 inches long until the 1980s when 4-foot traps were introduced. At that time nylon mesh was used on the front of the traps rather than oak laths, making traps lighter and easier to lift. Three bricks were used in each trap for ballast, except when a trap was set for the first time and another two or three bricks were added for extra weight while the wooden trap “soaked-up.” The heads, or nets, on both sides of the front and one larger net leading from the front of the trap to the “parlor” or back section of the trap allowed lobsters inside. A baited line was nailed to the middle bumper and attached at the top of the trap to a wooden “button.” It was a straight piece of oak lath (about 5 inches long) which had both ends whittled out to allow the bait string to be wrapped around and tied to the button. The bait string served two purposes: it secured the redfish bait and held the door of the trap shut. To keep the door closed, buttons were also put on the inside of the last lath of the door. The nets were knitted from sisal or manila rope. Whether round or square, the trap was completed with oak laths. When broken or badly chaffed, laths and occasionally the bumper had to be changed. Sometimes a fish or crab became entangled in the trap, creating a hole in the net. Each trap was “branded” on the end bumper with the fisherman’s state license number. Now lobster fishermen use vinyl-covered wire traps. These traps have “snapper” (small lobster) releases, nylon heads and rope, Styrofoam buoys and bobbers. Instead of branding traps, metal identification tags carrying the fisherman’s license number are used. Winter was a time to clean and paint buoys and repair or replace heads in traps. I also recall helping my father pick up traps on the beaches after a hurricane or big storm, especially during the summer when traps were in shallow water. Dislodged by heavy waves and currents, traps would be tangled in giant snarls “posies” of rope and buoys. Each buoy had a different color and the snarl of rope and traps looked like a posy. Pulling and carrying the traps and rope any distance was difficult but necessary. Each trap was valuable and most had been built at home and repaired annually. This entry was posted in Equipment We Used. Bookmark the permalink.